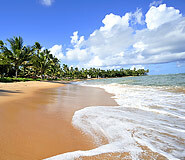 Discover Salvador de Bahia during your price guaranteed Brazil vacation. All of our Brazil tours have daily departures and are fully customizable. 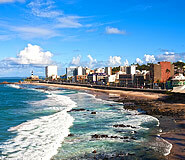 Considered Brazil’s “Capital of Happiness,” the friendly and welcoming residents of Salvador de Bahia –known simply as ‘Salvador’ – are deservingly proud of their northeast capital city, blessed as it is with a historically-rich past, gorgeous beaches, and one of the best Carnival celebrations in the world. Once the ex-capital of Brazil and the first colonial capital of the Portuguese empire, the city of Salvador features a fascinating history that locals to this day continue to hold on to, completely immersing themselves in their mixed African, Brazilian, and European heritage. Like Lisbon in the colonial motherland, the city is separated into a lower and upper sector, connected by electric elevators. In the higher part of the city – Pelourinho – you will find the biggest collection of colonial baroque architecture of Latin America, consisting of decorated churches and houses from the 17th through to the 19th centuries. As it is such a significant part of Salvador history, the center was declared a UNESCO World Heritage Site in 1985. Visit this region teeming with history and natural beauty during your custom-made and price-guaranteed Salvador vacation, made easy with the travel experts at Brazil for Less. The third most populous city in Brazil, and 9th in all of Latin America, offers some of the best beaches in the country, perfect for sailing, swimming and snorkeling. With over 30 miles (50 km) of beaches that stretch across the coastline of Salvador, there are plenty of options to take in a little sun or swim in the crystalline waters of this lovely city. Beaches are idyllic for sailing and snorkeling. Beach Porto da Barra is a great spot for surfing and underwater fishing. Wander through the city’s charming, lush parks, where there are plenty of recreational activities you can enjoy. Finally, enjoy a night of live Samba music at one of the city’s various live music venues, specializing in Brazil’s most famed genre of music. This charming city is also served by a number of shopping malls that feature high-end items, as well as more humble markets where you can find just about anything at a price that is easy on the wallet. During the day, be sure to visit one of Salvador’s many recreational parks where you can enjoy a picnic or work up a sweat playing on one of the sports courts. After nightfall, be sure to check out the city’s thriving music-scene at one of Salvador’s hip clubs where you can dance along to samba and Brazilian-inspired funk. While Rio de Janeiro continues to hold the Brazilian spotlight in terms of Carnival activities during early February every year, Salvador is also another major epicenter for the wildest party of the year. Prices skyrocket, crowds swell exponentially, and the city does not seem to sleep for days on end due to music and drink-influenced insomnia. April to June, then, is a quiet time for visiting Salvador because the town lazes back in the rainy season and recuperates from the needed repairs after Carnival. As a beach resort, the town still has incredibly pleasant weather during these months and generally all year. For enjoying the beaches, October to March is the best time to go to Salvador, when the South American summer is at its height and the sun shines like there’s no tomorrow. This is also the dry season, so there is no worry of rain infringing on your Brazil holiday plans. However, you will not be the only one with the good ideas in mind; Brazilians flock to their favorite beaches at the same time during their summer vacations, creating the high travel season. The Argentina and Brazil trip organized for us by Argentina for Less was great. The timing and amount of time for each place was very balanced and we were able to see a lot of things in a short amount of time. They were very accommodating and knowledgeable on the history and facts. The trip was also flexible enough for us to customize our agenda according to our interests. Considering the many countries (Peru, Chile, Argentina, and Brazil) we visited, and the 14 flights we took, all went well. We were always met on time by extremely competent guides. Once again, thank you for a great vacation and I will certainly recommend Brazil For Less to those who would like a stress free holiday in South America. "A Casa das Portas Velhas" features doors collected from the ruins of a 19th century manor which was restored to house this charming boutique hotel. Antique pieces adorn the walls and mirrors, and also serve as actual doors within the hotel, creating an atmosphere of classical antiquity and romanticism. Here you can enjoy delicious fare at the Aldrava Restaurant and the Capachinho Bar, which are sure to give you an unforgettable experience. The hotel offers 15 different rooms elegantly decorated in English colonial style and fully equipped with modern amenities. 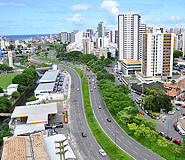 Located in one of the most charming and famous neighborhoods in the city, next to Porto and Barra beaches, shopping, banks, supermarkets, and close to several excellent bars and restaurants and other services and business centers in town, the Porto Farol Apart Hotel combines excellent services and ideal location. Featuring 39 apartments all equipped with their own kitchen and comfortable furniture, the hotel also boasts a swimming pool and delicious restaurant.